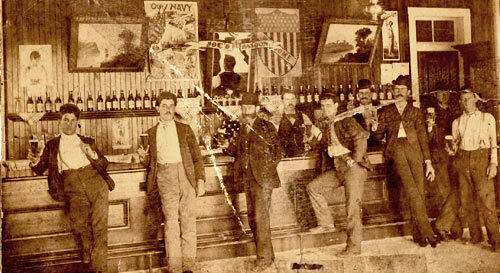 (l-r) Auguste F. Bellande (1876-1953, Peter Bellande (1871-1933), ?, Joseph Bellande (1868-1961)(behind bar), ?, Antoine Bellande Jr. (1869-1924)(behind bar), ?, ?, ? Marie Bellande seems to have been a woman of commerce. In 1889, she leased the Reynoir Street corner to Joseph Charles DeLamare (1856-1931) for one year and $300. On January 9, 1892, The Biloxi Herald announced that “the old Bellande Building near the depot has been torn down and the foundation is being laid for a two-story edifice”. From the plats on pages ? and ? which were traced from insurance maps prepared by the Sanborn-Perris Map Company of New York, you can determine how the physical configuration of the Bellande tract changed during the period 1893-1904.